Scientific Games stock has lost roughly two-thirds of its value year to date. Shares of Scientific Games Corporation (NASDAQ:SGMS) lost 12.5% of their value in November, according to data provided by S&P Global Market Intelligence. The stock spiked following the company's third-quarter earnings release, but the positive momentum proved to be short lived. Scientific Games stock saw double-digit gains in the day of trading following its earnings release on Nov. 8 as losses for the period came in lower than anticipated and management made comments suggesting that the company was considering spinning off its social games unit as its own public company. 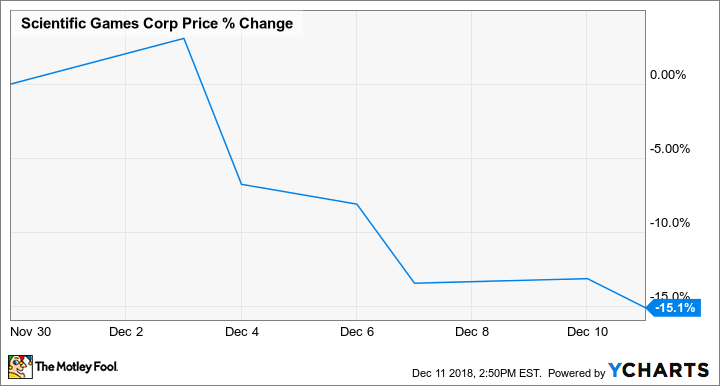 The market's read on the attractiveness of an initial public offering for the social games business then appeared to reverse, sending Scientific Games' share price to new year-long lows. Scientific Games' loss per share for the third quarter came in at $0.14, significantly better than the average analyst estimate for a per-share loss of $0.18, and sales for the period climbed 6.8% year over year to reach $821 million. The bigger catalyst for the company's post-earnings stock gains may have been management's comments about the possibility of spinning off the business's social games division for its own initial public offering. However, investor sentiment about whether spinning off the social games unit is a smart move appears to have quickly soured, and Scientific Games' stock hit a new 52-week low shortly thereafter. The stock did see some positive movement later in the month, with shares gaining double digits in daily trading following news that the company had partnered with Norwegian lottery operator Norsk Tipping to launch new games. However, these gains have since reversed. Scientific Games stock has continued to see steep sell-offs in December, with shares down 15.1% in the month as of this writing. The stock currently trades at a 52-week low and has lost roughly 68% of its value in 2018. 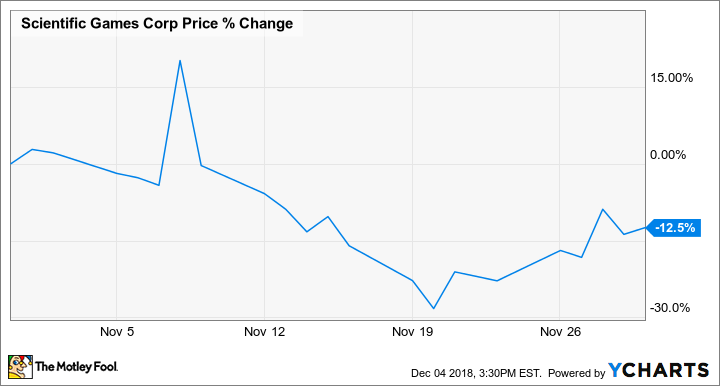 News that the vice president of the company's board, Gavin Isaacs, was departing from his position was made public on Dec. 10, but it's unclear to what extent this development has factored into the stock's movement this month. The company carried roughly $8.9 billion in debt on the books at the end of the September quarter, and broader market sell-offs, a rising interest rate environment, and overall reduced confidence in the business' growth strategy could be bigger factors in the recent decline.